For other uses, see Electron (disambiguation). Hydrogen atom orbitals at different energy levels. The more opaque areas are where one is most likely to find an electron at any given time. Electrons play an essential role in numerous physical phenomena, such as electricity, magnetism, chemistry and thermal conductivity, and they also participate in gravitational, electromagnetic and weak interactions. Since an electron has charge, it has a surrounding electric field, and if that electron is moving relative to an observer, it will generate a magnetic field. Electromagnetic fields produced from other sources will affect the motion of an electron according to the Lorentz force law. Electrons radiate or absorb energy in the form of photons when they are accelerated. Laboratory instruments are capable of trapping individual electrons as well as electron plasma by the use of electromagnetic fields. Special telescopes can detect electron plasma in outer space. Electrons are involved in many applications such as electronics, welding, cathode ray tubes, electron microscopes, radiation therapy, lasers, gaseous ionization detectors and particle accelerators. Interactions involving electrons with other subatomic particles are of interest in fields such as chemistry and nuclear physics. The Coulomb force interaction between the positive protons within atomic nuclei and the negative electrons without, allows the composition of the two known as atoms. Ionization or differences in the proportions of negative electrons versus positive nuclei changes the binding energy of an atomic system. The exchange or sharing of the electrons between two or more atoms is the main cause of chemical bonding. In 1838, British natural philosopher Richard Laming first hypothesized the concept of an indivisible quantity of electric charge to explain the chemical properties of atoms. Irish physicist George Johnstone Stoney named this charge 'electron' in 1891, and J. J. Thomson and his team of British physicists identified it as a particle in 1897. Electrons can also participate in nuclear reactions, such as nucleosynthesis in stars, where they are known as beta particles. Electrons can be created through beta decay of radioactive isotopes and in high-energy collisions, for instance when cosmic rays enter the atmosphere. The antiparticle of the electron is called the positron; it is identical to the electron except that it carries electrical and other charges of the opposite sign. When an electron collides with a positron, both particles can be annihilated, producing gamma ray photons. The ancient Greeks noticed that amber attracted small objects when rubbed with fur. Along with lightning, this phenomenon is one of humanity's earliest recorded experiences with electricity. In his 1600 treatise De Magnete, the English scientist William Gilbert coined the New Latin term electrica, to refer to those substances with property similar to that of amber which attract small objects after being rubbed. Both electric and electricity are derived from the Latin ēlectrum (also the root of the alloy of the same name), which came from the Greek word for amber, ἤλεκτρον (ēlektron). In the early 1700s, French chemist Charles François du Fay found that if a charged gold-leaf is repulsed by glass rubbed with silk, then the same charged gold-leaf is attracted by amber rubbed with wool. From this and other results of similar type of experiments, du Fay concluded that electricity consists of two electrical fluids, vitreousfluid from glass rubbed with silk and resinous fluid from amber rubbed with wool. These two fluids can neutralize each other when combined. American scientist Ebenezer Kinnersley later also independently reached the same conclusion. :118 A decade later Benjamin Franklin proposed that electricity was not from different types of electrical fluid, but a single electrical fluid showing an excess (+) or deficit (-). He gave them the modern charge nomenclature of positive and negative respectively. Franklin thought of the charge carrier as being positive, but he did not correctly identify which situation was a surplus of the charge carrier, and which situation was a deficit. Between 1838 and 1851, British natural philosopher Richard Laming developed the idea that an atom is composed of a core of matter surrounded by subatomic particles that had unit electric charges. Beginning in 1846, German physicist William Weber theorized that electricity was composed of positively and negatively charged fluids, and their interaction was governed by the inverse square law. After studying the phenomenon of electrolysis in 1874, Irish physicist George Johnstone Stoney suggested that there existed a "single definite quantity of electricity", the charge of a monovalent ion. He was able to estimate the value of this elementary charge e by means of Faraday's laws of electrolysis. However, Stoney believed these charges were permanently attached to atoms and could not be removed. In 1881, German physicist Hermann von Helmholtz argued that both positive and negative charges were divided into elementary parts, each of which "behaves like atoms of electricity". Stoney initially coined the term electrolion in 1881. Ten years later, he switched to electron to describe these elementary charges, writing in 1894: "... an estimate was made of the actual amount of this most remarkable fundamental unit of electricity, for which I have since ventured to suggest the name electron". A 1906 proposal to change to electrion failed because Hendrik Lorentz preferred to keep electron. The word electron is a combination of the words electric and ion. The suffix -on which is now used to designate other subatomic particles, such as a proton or neutron, is in turn derived from electron. The German physicist Johann Wilhelm Hittorf studied electrical conductivity in rarefied gases: in 1869, he discovered a glow emitted from the cathode that increased in size with decrease in gas pressure. In 1876, the German physicist Eugen Goldstein showed that the rays from this glow cast a shadow, and he dubbed the rays cathode rays. During the 1870s, the English chemist and physicist Sir William Crookes developed the first cathode ray tube to have a high vacuum inside. He then showed that the luminescence rays appearing within the tube carried energy and moved from the cathode to the anode. Furthermore, by applying a magnetic field, he was able to deflect the rays, thereby demonstrating that the beam behaved as though it were negatively charged. In 1879, he proposed that these properties could be explained by what he termed 'radiant matter'. He suggested that this was a fourth state of matter, consisting of negatively charged molecules that were being projected with high velocity from the cathode. The German-born British physicist Arthur Schuster expanded upon Crookes' experiments by placing metal plates parallel to the cathode rays and applying an electric potential between the plates. The field deflected the rays toward the positively charged plate, providing further evidence that the rays carried negative charge. By measuring the amount of deflection for a given level of current, in 1890 Schuster was able to estimate the charge-to-mass ratio of the ray components. However, this produced a value that was more than a thousand times greater than what was expected, so little credence was given to his calculations at the time. In 1892 Hendrik Lorentz suggested that the mass of these particles (electrons) could be a consequence of their electric charge. While studying naturally fluorescing minerals in 1896, the French physicist Henri Becquerel discovered that they emitted radiation without any exposure to an external energy source. These radioactive materials became the subject of much interest by scientists, including the New Zealand physicist Ernest Rutherford who discovered they emitted particles. He designated these particles alpha and beta, on the basis of their ability to penetrate matter. In 1900, Becquerel showed that the beta rays emitted by radium could be deflected by an electric field, and that their mass-to-charge ratio was the same as for cathode rays. This evidence strengthened the view that electrons existed as components of atoms. 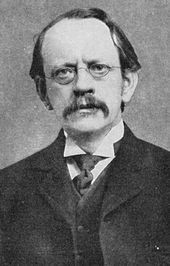 In 1897, the British physicist J. J. Thomson, with his colleagues John S. Townsend and H. A. Wilson, performed experiments indicating that cathode rays really were unique particles, rather than waves, atoms or molecules as was believed earlier. Thomson made good estimates of both the charge e and the mass m, finding that cathode ray particles, which he called "corpuscles," had perhaps one thousandth of the mass of the least massive ion known: hydrogen. He showed that their charge-to-mass ratio, e/m, was independent of cathode material. He further showed that the negatively charged particles produced by radioactive materials, by heated materials and by illuminated materials were universal. The name electron was again proposed for these particles by the Irish physicist George Johnstone Stoney, and the name has since gained universal acceptance. 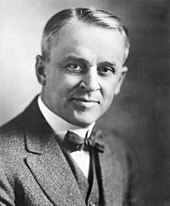 The electron's charge was more carefully measured by the American physicists Robert Millikan and Harvey Fletcher in their oil-drop experiment of 1909, the results of which were published in 1911. This experiment used an electric field to prevent a charged droplet of oil from falling as a result of gravity. This device could measure the electric charge from as few as 1–150 ions with an error margin of less than 0.3%. Comparable experiments had been done earlier by Thomson's team, using clouds of charged water droplets generated by electrolysis, and in 1911 by Abram Ioffe, who independently obtained the same result as Millikan using charged microparticles of metals, then published his results in 1913. However, oil drops were more stable than water drops because of their slower evaporation rate, and thus more suited to precise experimentation over longer periods of time. Around the beginning of the twentieth century, it was found that under certain conditions a fast-moving charged particle caused a condensation of supersaturated water vapor along its path. In 1911, Charles Wilson used this principle to devise his cloud chamber so he could photograph the tracks of charged particles, such as fast-moving electrons. 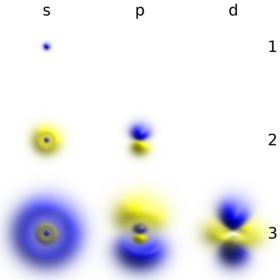 The Bohr model of the atom, showing states of electron with energy quantized by the number n. An electron dropping to a lower orbit emits a photon equal to the energy difference between the orbits. By 1914, experiments by physicists Ernest Rutherford, Henry Moseley, James Franck and Gustav Hertz had largely established the structure of an atom as a dense nucleus of positive charge surrounded by lower-mass electrons. In 1913, Danish physicist Niels Bohr postulated that electrons resided in quantized energy states, with their energies determined by the angular momentum of the electron's orbit about the nucleus. The electrons could move between those states, or orbits, by the emission or absorption of photons of specific frequencies. By means of these quantized orbits, he accurately explained the spectral lines of the hydrogen atom. However, Bohr's model failed to account for the relative intensities of the spectral lines and it was unsuccessful in explaining the spectra of more complex atoms. Chemical bonds between atoms were explained by Gilbert Newton Lewis, who in 1916 proposed that a covalent bond between two atoms is maintained by a pair of electrons shared between them. Later, in 1927, Walter Heitler and Fritz London gave the full explanation of the electron-pair formation and chemical bonding in terms of quantum mechanics. In 1919, the American chemist Irving Langmuir elaborated on the Lewis' static model of the atom and suggested that all electrons were distributed in successive "concentric (nearly) spherical shells, all of equal thickness". In turn, he divided the shells into a number of cells each of which contained one pair of electrons. With this model Langmuir was able to qualitatively explain the chemical properties of all elements in the periodic table, which were known to largely repeat themselves according to the periodic law. 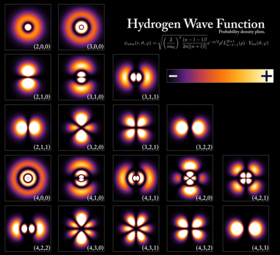 In 1924, Austrian physicist Wolfgang Pauli observed that the shell-like structure of the atom could be explained by a set of four parameters that defined every quantum energy state, as long as each state was occupied by no more than a single electron. This prohibition against more than one electron occupying the same quantum energy state became known as the Pauli exclusion principle. The physical mechanism to explain the fourth parameter, which had two distinct possible values, was provided by the Dutch physicists Samuel Goudsmit and George Uhlenbeck. In 1925, they suggested that an electron, in addition to the angular momentum of its orbit, possesses an intrinsic angular momentum and magnetic dipole moment. This is analogous to the rotation of the Earth on its axis as it orbits the Sun. The intrinsic angular momentum became known as spin, and explained the previously mysterious splitting of spectral lines observed with a high-resolution spectrograph; this phenomenon is known as fine structure splitting. In his 1924 dissertation Recherches sur la théorie des quanta (Research on Quantum Theory), French physicist Louis de Broglie hypothesized that all matter can be represented as a de Broglie wave in the manner of light. That is, under the appropriate conditions, electrons and other matter would show properties of either particles or waves. The corpuscular properties of a particle are demonstrated when it is shown to have a localized position in space along its trajectory at any given moment. The wave-like nature of light is displayed, for example, when a beam of light is passed through parallel slits thereby creating interference patterns. In 1927 George Paget Thomson, discovered the interference effect was produced when a beam of electrons was passed through thin metal foils and by American physicists Clinton Davisson and Lester Germer by the reflection of electrons from a crystal of nickel. In quantum mechanics, the behavior of an electron in an atom is described by an orbital, which is a probability distribution rather than an orbit. In the figure, the shading indicates the relative probability to "find" the electron, having the energy corresponding to the given quantum numbers, at that point. De Broglie's prediction of a wave nature for electrons led Erwin Schrödinger to postulate a wave equation for electrons moving under the influence of the nucleus in the atom. In 1926, this equation, the Schrödinger equation, successfully described how electron waves propagated. Rather than yielding a solution that determined the location of an electron over time, this wave equation also could be used to predict the probability of finding an electron near a position, especially a position near where the electron was bound in space, for which the electron wave equations did not change in time. This approach led to a second formulation of quantum mechanics (the first by Heisenberg in 1925), and solutions of Schrödinger's equation, like Heisenberg's, provided derivations of the energy states of an electron in a hydrogen atom that were equivalent to those that had been derived first by Bohr in 1913, and that were known to reproduce the hydrogen spectrum. Once spin and the interaction between multiple electrons were describable, quantum mechanics made it possible to predict the configuration of electrons in atoms with atomic numbers greater than hydrogen. In 1928, building on Wolfgang Pauli's work, Paul Dirac produced a model of the electron – the Dirac equation, consistent with relativity theory, by applying relativistic and symmetry considerations to the hamiltonian formulation of the quantum mechanics of the electro-magnetic field. In order to resolve some problems within his relativistic equation, Dirac developed in 1930 a model of the vacuum as an infinite sea of particles with negative energy, later dubbed the Dirac sea. This led him to predict the existence of a positron, the antimatter counterpart of the electron. This particle was discovered in 1932 by Carl Anderson, who proposed calling standard electrons negatons and using electron as a generic term to describe both the positively and negatively charged variants. In 1947 Willis Lamb, working in collaboration with graduate student Robert Retherford, found that certain quantum states of the hydrogen atom, which should have the same energy, were shifted in relation to each other; the difference came to be called the Lamb shift. About the same time, Polykarp Kusch, working with Henry M. Foley, discovered the magnetic moment of the electron is slightly larger than predicted by Dirac's theory. This small difference was later called anomalous magnetic dipole moment of the electron. This difference was later explained by the theory of quantum electrodynamics, developed by Sin-Itiro Tomonaga, Julian Schwinger and Richard Feynman in the late 1940s. With the development of the particle accelerator during the first half of the twentieth century, physicists began to delve deeper into the properties of subatomic particles. The first successful attempt to accelerate electrons using electromagnetic induction was made in 1942 by Donald Kerst. His initial betatron reached energies of 2.3 MeV, while subsequent betatrons achieved 300 MeV. In 1947, synchrotron radiation was discovered with a 70 MeV electron synchrotron at General Electric. This radiation was caused by the acceleration of electrons through a magnetic field as they moved near the speed of light. With a beam energy of 1.5 GeV, the first high-energy particle collider was ADONE, which began operations in 1968. This device accelerated electrons and positrons in opposite directions, effectively doubling the energy of their collision when compared to striking a static target with an electron. The Large Electron–Positron Collider (LEP) at CERN, which was operational from 1989 to 2000, achieved collision energies of 209 GeV and made important measurements for the Standard Model of particle physics. Individual electrons can now be easily confined in ultra small (L = 20 nm, W = 20 nm) CMOS transistors operated at cryogenic temperature over a range of −269 °C (4 K) to about −258 °C (15 K). The electron wavefunction spreads in a semiconductor lattice and negligibly interacts with the valence band electrons, so it can be treated in the single particle formalism, by replacing its mass with the effective mass tensor. 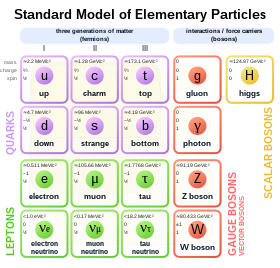 Standard Model of elementary particles. The electron (symbol e) is on the left. In the Standard Model of particle physics, electrons belong to the group of subatomic particles called leptons, which are believed to be fundamental or elementary particles. Electrons have the lowest mass of any charged lepton (or electrically charged particle of any type) and belong to the first-generation of fundamental particles. The second and third generation contain charged leptons, the muon and the tau, which are identical to the electron in charge, spin and interactions, but are more massive. Leptons differ from the other basic constituent of matter, the quarks, by their lack of strong interaction. All members of the lepton group are fermions, because they all have half-odd integer spin; the electron has spin 1/2. The invariant mass of an electron is approximately 6969910900000000000♠9.109×10−31 kilograms, or 6996548900000000000♠5.489×10−4 atomic mass units. On the basis of Einstein's principle of mass–energy equivalence, this mass corresponds to a rest energy of 0.511 MeV. The ratio between the mass of a proton and that of an electron is about 1836. Astronomical measurements show that the proton-to-electron mass ratio has held the same value, as is predicted by the Standard Model, for at least half the age of the universe. because it has the same properties as the electron but with a positive rather than negative charge. The electron has an intrinsic angular momentum or spin of 1/2. This property is usually stated by referring to the electron as a spin-1/2 particle. 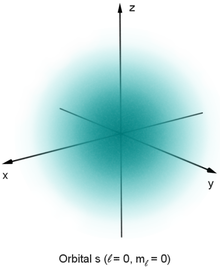 For such particles the spin magnitude is √3/2 ħ. [note 3] while the result of the measurement of a projection of the spin on any axis can only be ±ħ/2. In addition to spin, the electron has an intrinsic magnetic moment along its spin axis. It is approximately equal to one Bohr magneton,[note 4] which is a physical constant equal to 6976927400914999999♠9.27400915(23)×10−24 joules per tesla. The orientation of the spin with respect to the momentum of the electron defines the property of elementary particles known as helicity. The electron has no known substructure and it is assumed to be a point particle with a point charge and no spatial extent. There are elementary particles that spontaneously decay into less massive particles. 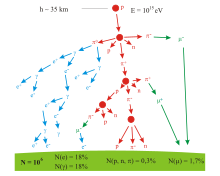 An example is the muon, with a mean lifetime of 6994220000000000000♠2.2×10−6 seconds, which decays into an electron, a muon neutrino and an electron antineutrino. The electron, on the other hand, is thought to be stable on theoretical grounds: the electron is the least massive particle with non-zero electric charge, so its decay would violate charge conservation. The experimental lower bound for the electron's mean lifetime is 7028659999999999999♠6.6×1028 years, at a 90% confidence level. Example of an antisymmetric wave function for a quantum state of two identical fermions in a 1-dimensional box. If the particles swap position, the wave function inverts its sign. In a simplified picture, every photon spends some time as a combination of a virtual electron plus its antiparticle, the virtual positron, which rapidly annihilate each other shortly thereafter. The combination of the energy variation needed to create these particles, and the time during which they exist, fall under the threshold of detectability expressed by the Heisenberg uncertainty relation, ΔE · Δt ≥ ħ. In effect, the energy needed to create these virtual particles, ΔE, can be "borrowed" from the vacuum for a period of time, Δt, so that their product is no more than the reduced Planck constant, ħ ≈ 6984660000000000000♠6.6×10−16 eV·s. Thus, for a virtual electron, Δt is at most 6979129999999999999♠1.3×10−21 s.
While an electron–positron virtual pair is in existence, the coulomb force from the ambient electric field surrounding an electron causes a created positron to be attracted to the original electron, while a created electron experiences a repulsion. This causes what is called vacuum polarization. In effect, the vacuum behaves like a medium having a dielectric permittivity more than unity. Thus the effective charge of an electron is actually smaller than its true value, and the charge decreases with increasing distance from the electron. This polarization was confirmed experimentally in 1997 using the Japanese TRISTAN particle accelerator. Virtual particles cause a comparable shielding effect for the mass of the electron. The interaction with virtual particles also explains the small (about 0.1%) deviation of the intrinsic magnetic moment of the electron from the Bohr magneton (the anomalous magnetic moment). The extraordinarily precise agreement of this predicted difference with the experimentally determined value is viewed as one of the great achievements of quantum electrodynamics. The apparent paradox in classical physics of a point particle electron having intrinsic angular momentum and magnetic moment can be explained by the formation of virtual photons in the electric field generated by the electron. These photons cause the electron to shift about in a jittery fashion (known as zitterbewegung), which results in a net circular motion with precession. This motion produces both the spin and the magnetic moment of the electron. In atoms, this creation of virtual photons explains the Lamb shift observed in spectral lines. 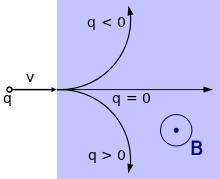 A particle with charge q (at left) is moving with velocity v through a magnetic field B that is oriented toward the viewer. For an electron, q is negative so it follows a curved trajectory toward the top. When an electron is moving through a magnetic field, it is subject to the Lorentz force that acts perpendicularly to the plane defined by the magnetic field and the electron velocity. This centripetal force causes the electron to follow a helical trajectory through the field at a radius called the gyroradius. The acceleration from this curving motion induces the electron to radiate energy in the form of synchrotron radiation. :160[note 6] The energy emission in turn causes a recoil of the electron, known as the Abraham–Lorentz–Dirac Force, which creates a friction that slows the electron. This force is caused by a back-reaction of the electron's own field upon itself. Here, Bremsstrahlung is produced by an electron e deflected by the electric field of an atomic nucleus. The energy change E2 − E1 determines the frequency f of the emitted photon. Photons mediate electromagnetic interactions between particles in quantum electrodynamics. An isolated electron at a constant velocity cannot emit or absorb a real photon; doing so would violate conservation of energy and momentum. Instead, virtual photons can transfer momentum between two charged particles. This exchange of virtual photons, for example, generates the Coulomb force. Energy emission can occur when a moving electron is deflected by a charged particle, such as a proton. The acceleration of the electron results in the emission of Bremsstrahlung radiation. An inelastic collision between a photon (light) and a solitary (free) electron is called Compton scattering. This collision results in a transfer of momentum and energy between the particles, which modifies the wavelength of the photon by an amount called the Compton shift. [note 7] The maximum magnitude of this wavelength shift is h/mec, which is known as the Compton wavelength. For an electron, it has a value of 6988243000000000000♠2.43×10−12 m. When the wavelength of the light is long (for instance, the wavelength of the visible light is 0.4–0.7 μm) the wavelength shift becomes negligible. Such interaction between the light and free electrons is called Thomson scattering or linear Thomson scattering. The relative strength of the electromagnetic interaction between two charged particles, such as an electron and a proton, is given by the fine-structure constant. This value is a dimensionless quantity formed by the ratio of two energies: the electrostatic energy of attraction (or repulsion) at a separation of one Compton wavelength, and the rest energy of the charge. It is given by α ≈ 6997729735300000000♠7.297353×10−3, which is approximately equal to 1/137. When electrons and positrons collide, they annihilate each other, giving rise to two or more gamma ray photons. If the electron and positron have negligible momentum, a positronium atom can form before annihilation results in two or three gamma ray photons totalling 1.022 MeV. On the other hand, a high-energy photon can transform into an electron and a positron by a process called pair production, but only in the presence of a nearby charged particle, such as a nucleus. exchange, and this is responsible for neutrino-electron elastic scattering. Probability densities for the first few hydrogen atom orbitals, seen in cross-section. The energy level of a bound electron determines the orbital it occupies, and the color reflects the probability of finding the electron at a given position. An electron can be bound to the nucleus of an atom by the attractive Coulomb force. A system of one or more electrons bound to a nucleus is called an atom. 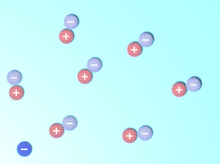 If the number of electrons is different from the nucleus' electrical charge, such an atom is called an ion. The wave-like behavior of a bound electron is described by a function called an atomic orbital. Each orbital has its own set of quantum numbers such as energy, angular momentum and projection of angular momentum, and only a discrete set of these orbitals exist around the nucleus. According to the Pauli exclusion principle each orbital can be occupied by up to two electrons, which must differ in their spin quantum number. Electrons can transfer between different orbitals by the emission or absorption of photons with an energy that matches the difference in potential. Other methods of orbital transfer include collisions with particles, such as electrons, and the Auger effect. To escape the atom, the energy of the electron must be increased above its binding energy to the atom. This occurs, for example, with the photoelectric effect, where an incident photon exceeding the atom's ionization energy is absorbed by the electron. The orbital angular momentum of electrons is quantized. Because the electron is charged, it produces an orbital magnetic moment that is proportional to the angular momentum. The net magnetic moment of an atom is equal to the vector sum of orbital and spin magnetic moments of all electrons and the nucleus. The magnetic moment of the nucleus is negligible compared with that of the electrons. The magnetic moments of the electrons that occupy the same orbital (so called, paired electrons) cancel each other out. The chemical bond between atoms occurs as a result of electromagnetic interactions, as described by the laws of quantum mechanics. The strongest bonds are formed by the sharing or transfer of electrons between atoms, allowing the formation of molecules. Within a molecule, electrons move under the influence of several nuclei, and occupy molecular orbitals; much as they can occupy atomic orbitals in isolated atoms. A fundamental factor in these molecular structures is the existence of electron pairs. These are electrons with opposed spins, allowing them to occupy the same molecular orbital without violating the Pauli exclusion principle (much like in atoms). Different molecular orbitals have different spatial distribution of the electron density. For instance, in bonded pairs (i.e. in the pairs that actually bind atoms together) electrons can be found with the maximal probability in a relatively small volume between the nuclei. By contrast, in non-bonded pairs electrons are distributed in a large volume around nuclei. If a body has more or fewer electrons than are required to balance the positive charge of the nuclei, then that object has a net electric charge. When there is an excess of electrons, the object is said to be negatively charged. When there are fewer electrons than the number of protons in nuclei, the object is said to be positively charged. When the number of electrons and the number of protons are equal, their charges cancel each other and the object is said to be electrically neutral. A macroscopic body can develop an electric charge through rubbing, by the triboelectric effect. Independent electrons moving in vacuum are termed free electrons. Electrons in metals also behave as if they were free. In reality the particles that are commonly termed electrons in metals and other solids are quasi-electrons—quasiparticles, which have the same electrical charge, spin, and magnetic moment as real electrons but might have a different mass. When free electrons—both in vacuum and metals—move, they produce a net flow of charge called an electric current, which generates a magnetic field. Likewise a current can be created by a changing magnetic field. These interactions are described mathematically by Maxwell's equations. At a given temperature, each material has an electrical conductivity that determines the value of electric current when an electric potential is applied. Examples of good conductors include metals such as copper and gold, whereas glass and Teflon are poor conductors. In any dielectric material, the electrons remain bound to their respective atoms and the material behaves as an insulator. Most semiconductors have a variable level of conductivity that lies between the extremes of conduction and insulation. On the other hand, metals have an electronic band structure containing partially filled electronic bands. The presence of such bands allows electrons in metals to behave as if they were free or delocalized electrons. These electrons are not associated with specific atoms, so when an electric field is applied, they are free to move like a gas (called Fermi gas) through the material much like free electrons. Because of collisions between electrons and atoms, the drift velocity of electrons in a conductor is on the order of millimeters per second. However, the speed at which a change of current at one point in the material causes changes in currents in other parts of the material, the velocity of propagation, is typically about 75% of light speed. This occurs because electrical signals propagate as a wave, with the velocity dependent on the dielectric constant of the material. Metals make relatively good conductors of heat, primarily because the delocalized electrons are free to transport thermal energy between atoms. However, unlike electrical conductivity, the thermal conductivity of a metal is nearly independent of temperature. This is expressed mathematically by the Wiedemann–Franz law, which states that the ratio of thermal conductivity to the electrical conductivity is proportional to the temperature. The thermal disorder in the metallic lattice increases the electrical resistivity of the material, producing a temperature dependence for electric current. When cooled below a point called the critical temperature, materials can undergo a phase transition in which they lose all resistivity to electric current, in a process known as superconductivity. In BCS theory, pairs of electrons called Cooper pairs have their motion coupled to nearby matter via lattice vibrations called phonons, thereby avoiding the collisions with atoms that normally create electrical resistance. (Cooper pairs have a radius of roughly 100 nm, so they can overlap each other.) However, the mechanism by which higher temperature superconductors operate remains uncertain. Electrons inside conducting solids, which are quasi-particles themselves, when tightly confined at temperatures close to absolute zero, behave as though they had split into three other quasiparticles: spinons, orbitons and holons. The former carries spin and magnetic moment, the next carries its orbital location while the latter electrical charge. According to Einstein's theory of special relativity, as an electron's speed approaches the speed of light, from an observer's point of view its relativistic mass increases, thereby making it more and more difficult to accelerate it from within the observer's frame of reference. 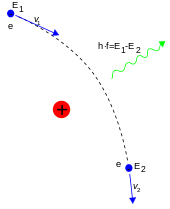 The speed of an electron can approach, but never reach, the speed of light in a vacuum, c. However, when relativistic electrons—that is, electrons moving at a speed close to c—are injected into a dielectric medium such as water, where the local speed of light is significantly less than c, the electrons temporarily travel faster than light in the medium. As they interact with the medium, they generate a faint light called Cherenkov radiation. 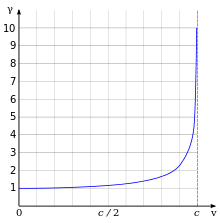 Lorentz factor as a function of velocity. It starts at value 1 and goes to infinity as v approaches c.
where me is the mass of electron. For example, the Stanford linear accelerator can accelerate an electron to roughly 51 GeV. Since an electron behaves as a wave, at a given velocity it has a characteristic de Broglie wavelength. This is given by λe = h/p where h is the Planck constant and p is the momentum. For the 51 GeV electron above, the wavelength is about 6983240000000000000♠2.4×10−17 m, small enough to explore structures well below the size of an atomic nucleus. Pair production of an electron and positron, caused by the close approach of a photon with an atomic nucleus. 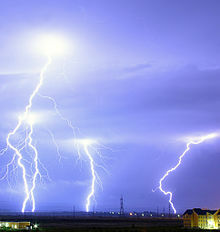 The lightning symbol represents an exchange of a virtual photon, thus an electric force acts. The angle between the particles is very small. An equilibrium between electrons, positrons and photons was maintained during this phase of the evolution of the Universe. After 15 seconds had passed, however, the temperature of the universe dropped below the threshold where electron-positron formation could occur. Most of the surviving electrons and positrons annihilated each other, releasing gamma radiation that briefly reheated the universe. For about the next 7005300000000000000♠300000–7013126230400000000♠400000 years, the excess electrons remained too energetic to bind with atomic nuclei. What followed is a period known as recombination, when neutral atoms were formed and the expanding universe became transparent to radiation. At the end of its lifetime, a star with more than about 20 solar masses can undergo gravitational collapse to form a black hole. According to classical physics, these massive stellar objects exert a gravitational attraction that is strong enough to prevent anything, even electromagnetic radiation, from escaping past the Schwarzschild radius. However, quantum mechanical effects are believed to potentially allow the emission of Hawking radiation at this distance. Electrons (and positrons) are thought to be created at the event horizon of these stellar remnants. When a pair of virtual particles (such as an electron and positron) is created in the vicinity of the event horizon, random spatial positioning might result in one of them to appear on the exterior; this process is called quantum tunnelling. The gravitational potential of the black hole can then supply the energy that transforms this virtual particle into a real particle, allowing it to radiate away into space. In exchange, the other member of the pair is given negative energy, which results in a net loss of mass-energy by the black hole. The rate of Hawking radiation increases with decreasing mass, eventually causing the black hole to evaporate away until, finally, it explodes. Cosmic rays are particles traveling through space with high energies. Energy events as high as 7001480652946100000♠3.0×1020 eV have been recorded. When these particles collide with nucleons in the Earth's atmosphere, a shower of particles is generated, including pions. More than half of the cosmic radiation observed from the Earth's surface consists of muons. The particle called a muon is a lepton produced in the upper atmosphere by the decay of a pion. A muon, in turn, can decay to form an electron or positron. Aurorae are mostly caused by energetic electrons precipitating into the atmosphere. Remote observation of electrons requires detection of their radiated energy. For example, in high-energy environments such as the corona of a star, free electrons form a plasma that radiates energy due to Bremsstrahlung radiation. Electron gas can undergo plasma oscillation, which is waves caused by synchronized variations in electron density, and these produce energy emissions that can be detected by using radio telescopes. The frequency of a photon is proportional to its energy. As a bound electron transitions between different energy levels of an atom, it absorbs or emits photons at characteristic frequencies. For instance, when atoms are irradiated by a source with a broad spectrum, distinct absorption lines appear in the spectrum of transmitted radiation. Each element or molecule displays a characteristic set of spectral lines, such as the hydrogen spectral series. Spectroscopic measurements of the strength and width of these lines allow the composition and physical properties of a substance to be determined. In laboratory conditions, the interactions of individual electrons can be observed by means of particle detectors, which allow measurement of specific properties such as energy, spin and charge. 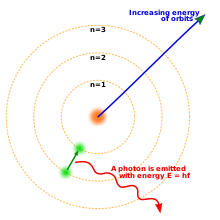 The development of the Paul trap and Penning trap allows charged particles to be contained within a small region for long durations. This enables precise measurements of the particle properties. For example, in one instance a Penning trap was used to contain a single electron for a period of 10 months. The magnetic moment of the electron was measured to a precision of eleven digits, which, in 1980, was a greater accuracy than for any other physical constant. The first video images of an electron's energy distribution were captured by a team at Lund University in Sweden, February 2008. The scientists used extremely short flashes of light, called attosecond pulses, which allowed an electron's motion to be observed for the first time. The distribution of the electrons in solid materials can be visualized by angle-resolved photoemission spectroscopy (ARPES). This technique employs the photoelectric effect to measure the reciprocal space—a mathematical representation of periodic structures that is used to infer the original structure. ARPES can be used to determine the direction, speed and scattering of electrons within the material. 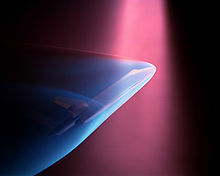 During a NASA wind tunnel test, a model of the Space Shuttle is targeted by a beam of electrons, simulating the effect of ionizing gases during re-entry. Electron beams are used in welding. They allow energy densities up to 7007100000000000000♠107 W·cm−2 across a narrow focus diameter of 0.1–1.3 mm and usually require no filler material. This welding technique must be performed in a vacuum to prevent the electrons from interacting with the gas before reaching their target, and it can be used to join conductive materials that would otherwise be considered unsuitable for welding. Electron-beam lithography (EBL) is a method of etching semiconductors at resolutions smaller than a micrometer. This technique is limited by high costs, slow performance, the need to operate the beam in the vacuum and the tendency of the electrons to scatter in solids. The last problem limits the resolution to about 10 nm. For this reason, EBL is primarily used for the production of small numbers of specialized integrated circuits. Electron beam processing is used to irradiate materials in order to change their physical properties or sterilize medical and food products. Electron beams fluidise or quasi-melt glasses without significant increase of temperature on intensive irradiation: e.g. intensive electron radiation causes a many orders of magnitude decrease of viscosity and stepwise decrease of its activation energy. Linear particle accelerators generate electron beams for treatment of superficial tumors in radiation therapy. Electron therapy can treat such skin lesions as basal-cell carcinomas because an electron beam only penetrates to a limited depth before being absorbed, typically up to 5 cm for electron energies in the range 5–20 MeV. An electron beam can be used to supplement the treatment of areas that have been irradiated by X-rays. Particle accelerators use electric fields to propel electrons and their antiparticles to high energies. These particles emit synchrotron radiation as they pass through magnetic fields. The dependency of the intensity of this radiation upon spin polarizes the electron beam—a process known as the Sokolov–Ternov effect. [note 8] Polarized electron beams can be useful for various experiments. Synchrotron radiation can also cool the electron beams to reduce the momentum spread of the particles. Electron and positron beams are collided upon the particles' accelerating to the required energies; particle detectors observe the resulting energy emissions, which particle physics studies . Low-energy electron diffraction (LEED) is a method of bombarding a crystalline material with a collimated beam of electrons and then observing the resulting diffraction patterns to determine the structure of the material. The required energy of the electrons is typically in the range 20–200 eV. The reflection high-energy electron diffraction (RHEED) technique uses the reflection of a beam of electrons fired at various low angles to characterize the surface of crystalline materials. The beam energy is typically in the range 8–20 keV and the angle of incidence is 1–4°. The electron microscope directs a focused beam of electrons at a specimen. Some electrons change their properties, such as movement direction, angle, and relative phase and energy as the beam interacts with the material. Microscopists can record these changes in the electron beam to produce atomically resolved images of the material. In blue light, conventional optical microscopes have a diffraction-limited resolution of about 200 nm. By comparison, electron microscopes are limited by the de Broglie wavelength of the electron. This wavelength, for example, is equal to 0.0037 nm for electrons accelerated across a 100,000-volt potential. The Transmission Electron Aberration-Corrected Microscope is capable of sub-0.05 nm resolution, which is more than enough to resolve individual atoms. This capability makes the electron microscope a useful laboratory instrument for high resolution imaging. However, electron microscopes are expensive instruments that are costly to maintain. Two main types of electron microscopes exist: transmission and scanning. Transmission electron microscopes function like overhead projectors, with a beam of electrons passing through a slice of material then being projected by lenses on a photographic slide or a charge-coupled device. Scanning electron microscopes rasteri a finely focused electron beam, as in a TV set, across the studied sample to produce the image. Magnifications range from 100× to 1,000,000× or higher for both microscope types. The scanning tunneling microscope uses quantum tunneling of electrons from a sharp metal tip into the studied material and can produce atomically resolved images of its surface. In the free-electron laser (FEL), a relativistic electron beam passes through a pair of undulators that contain arrays of dipole magnets whose fields point in alternating directions. The electrons emit synchrotron radiation that coherently interacts with the same electrons to strongly amplify the radiation field at the resonance frequency. FEL can emit a coherent high-brilliance electromagnetic radiation with a wide range of frequencies, from microwaves to soft X-rays. These devices are used in manufacturing, communication, and in medical applications, such as soft tissue surgery. Electrons are important in cathode ray tubes, which have been extensively used as display devices in laboratory instruments, computer monitors and television sets. In a photomultiplier tube, every photon striking the photocathode initiates an avalanche of electrons that produces a detectable current pulse. Vacuum tubes use the flow of electrons to manipulate electrical signals, and they played a critical role in the development of electronics technology. However, they have been largely supplanted by solid-state devices such as the transistor. ^ The fractional version's denominator is the inverse of the decimal value (along with its relative standard uncertainty of 6987420000000000000♠4.2×10−13 u). ^ The electron's charge is the negative of elementary charge, which has a positive value for the proton. for quantum number s = 1/2. See: Gupta, M.C. (2001). Atomic and Molecular Spectroscopy. New Age Publishers. p. 81. ISBN 978-81-224-1300-7. ^ The classical electron radius is derived as follows. Assume that the electron's charge is spread uniformly throughout a spherical volume. Since one part of the sphere would repel the other parts, the sphere contains electrostatic potential energy. This energy is assumed to equal the electron's rest energy, defined by special relativity (E = mc2). where c is the speed of light in a vacuum. Setting them equal and solving for r gives the classical electron radius. See: Haken, H.; Wolf, H.C.; Brewer, W.D. (2005). The Physics of Atoms and Quanta: Introduction to Experiments and Theory. Springer. p. 70. ISBN 978-3-540-67274-6. ^ Radiation from non-relativistic electrons is sometimes termed cyclotron radiation. where c is the speed of light in a vacuum and me is the electron mass. See Zombeck (2007: 393, 396). ^ The polarization of an electron beam means that the spins of all electrons point into one direction. In other words, the projections of the spins of all electrons onto their momentum vector have the same sign. ^ a b c Eichten, E.J. ; Peskin, M.E. ; Peskin, M. (1983). "New Tests for Quark and Lepton Substructure". Physical Review Letters. 50 (11): 811–814. Bibcode:1983PhRvL..50..811E. doi:10.1103/PhysRevLett.50.811. ^ a b Farrar, W.V. (1969). "Richard Laming and the Coal-Gas Industry, with His Views on the Structure of Matter". Annals of Science. 25 (3): 243–254. doi:10.1080/00033796900200141. ^ a b c Arabatzis, T. (2006). Representing Electrons: A Biographical Approach to Theoretical Entities. University of Chicago Press. pp. 70–74. ISBN 978-0-226-02421-9. ^ Buchwald, J.Z. ; Warwick, A. (2001). Histories of the Electron: The Birth of Microphysics. MIT Press. pp. 195–203. ISBN 978-0-262-52424-7. ^ a b c d e f Thomson, J.J. (1897). "Cathode Rays". Philosophical Magazine. 44 (269): 293–316. doi:10.1080/14786449708621070. ^ a b c d e P.J. Mohr, B.N. Taylor, and D.B. Newell, "The 2014 CODATA Recommended Values of the Fundamental Physical Constants". This database was developed by J. Baker, M. Douma, and S. Kotochigova. Available: . National Institute of Standards and Technology, Gaithersburg, MD 20899. ^ a b Agostini, M.; et al. (Borexino Collaboration) (2015). "Test of Electric Charge Conservation with Borexino". Physical Review Letters. 115 (23): 231802. arXiv:1509.01223. Bibcode:2015PhRvL.115w1802A. doi:10.1103/PhysRevLett.115.231802. PMID 26684111. ^ Coff, Jerry (2010-09-10). "What Is An Electron". Retrieved 10 September 2010. ^ a b c d Curtis, L.J. (2003). Atomic Structure and Lifetimes: A Conceptual Approach. Cambridge University Press. p. 74. ISBN 978-0-521-53635-6. ^ a b "CODATA value: proton-electron mass ratio". 2006 CODATA recommended values. National Institute of Standards and Technology. Retrieved 2009-07-18. ^ Anastopoulos, C. (2008). Particle Or Wave: The Evolution of the Concept of Matter in Modern Physics. Princeton University Press. pp. 236–237. ISBN 978-0-691-13512-0. ^ a b Pauling, L.C. (1960). The Nature of the Chemical Bond and the Structure of Molecules and Crystals: an introduction to modern structural chemistry (3rd ed.). Cornell University Press. pp. 4–10. ISBN 978-0-8014-0333-0. ^ Shipley, J.T. (1945). Dictionary of Word Origins. The Philosophical Library. p. 133. ISBN 978-0-88029-751-6. ^ Keithley, J.F. (1999). The Story of Electrical and Magnetic Measurements: From 500 B.C. to the 1940s. IEEE Press. pp. 19–20. ISBN 978-0-7803-1193-0. ^ Cajori, Florian (1917). A History of Physics in Its Elementary Branches: Including the Evolution of Physical Laboratories. Macmillan. ^ "Benjamin Franklin (1706–1790)". Eric Weisstein's World of Biography. Wolfram Research. Retrieved 2010-12-16. ^ Myers, R.L. (2006). The Basics of Physics. Greenwood Publishing Group. p. 242. ISBN 978-0-313-32857-2. ^ Barrow, J.D. (1983). "Natural Units Before Planck". Quarterly Journal of the Royal Astronomical Society. 24: 24–26. Bibcode:1983QJRAS..24...24B. ^ Okamura, Sōgo (1994). History of Electron Tubes. IOS Press. p. 11. ISBN 978-90-5199-145-1. Retrieved 29 May 2015. In 1881, Stoney named this electromagnetic 'electrolion'. It came to be called 'electron' from 1891. [...] In 1906, the suggestion to call cathode ray particles 'electrions' was brought up but through the opinion of Lorentz of Holland 'electrons' came to be widely used. ^ Stoney, G.J. (1894). "Of the "Electron," or Atom of Electricity". Philosophical Magazine. 38 (5): 418–420. doi:10.1080/14786449408620653. ^ Soukhanov, A.H., ed. (1986). Word Mysteries & Histories. Houghton Mifflin. p. 73. ISBN 978-0-395-40265-8. ^ Guralnik, D.B., ed. (1970). Webster's New World Dictionary. Prentice Hall. p. 450. ^ Born, M.; Blin-Stoyle, R.J.; Radcliffe, J.M. (1989). Atomic Physics. Courier Dover. p. 26. ISBN 978-0-486-65984-8. ^ DeKosky, R.K. (1983). "William Crookes and the quest for absolute vacuum in the 1870s". Annals of Science. 40 (1): 1–18. doi:10.1080/00033798300200101. ^ a b Leicester, H.M. (1971). The Historical Background of Chemistry. Courier Dover. pp. 221–222. ISBN 978-0-486-61053-5. ^ Zeeman, P. (1907). Lockyer, Norman (ed.). "Sir William Crookes, F.R.S". Nature. 77 (1984): 1–3. Bibcode:1907Natur..77....1C. doi:10.1038/077001a0. ^ Frank Wilczek: "Happy Birthday, Electron" Scientific American, June 2012. ^ Trenn, T.J. (1976). "Rutherford on the Alpha-Beta-Gamma Classification of Radioactive Rays". Isis. 67 (1): 61–75. doi:10.1086/351545. JSTOR 231134. ^ Becquerel, H. (1900). "Déviation du Rayonnement du Radium dans un Champ Électrique". Comptes rendus de l'Académie des sciences (in French). 130: 809–815. ^ Myers, W.G. (1976). "Becquerel's Discovery of Radioactivity in 1896". Journal of Nuclear Medicine. 17 (7): 579–582. PMID 775027. ^ Thomson, J.J. (1906). "Nobel Lecture: Carriers of Negative Electricity" (PDF). The Nobel Foundation. Archived from the original (PDF) on 2008-10-10. Retrieved 2008-08-25. ^ Kikoin, I.K. ; Sominskiĭ, I.S. (1961). "Abram Fedorovich Ioffe (on his eightieth birthday)". Soviet Physics Uspekhi. 3 (5): 798–809. Bibcode:1961SvPhU...3..798K. doi:10.1070/PU1961v003n05ABEH005812. Original publication in Russian: Кикоин, И.К. ; Соминский, М.С. (1960). "Академик А.Ф. Иоффе" (PDF). Успехи Физических Наук. 72 (10): 303–321. doi:10.3367/UFNr.0072.196010e.0307. ^ Millikan, R.A. (1911). "The Isolation of an Ion, a Precision Measurement of its Charge, and the Correction of Stokes' Law". Physical Review. 32 (2): 349–397. Bibcode:1911PhRvI..32..349M. doi:10.1103/PhysRevSeriesI.32.349. ^ Das Gupta, N.N. ; Ghosh, S.K. (1999). "A Report on the Wilson Cloud Chamber and Its Applications in Physics". Reviews of Modern Physics. 18 (2): 225–290. Bibcode:1946RvMP...18..225G. doi:10.1103/RevModPhys.18.225. ^ a b c Smirnov, B.M. (2003). Physics of Atoms and Ions. Springer. pp. 14–21. ISBN 978-0-387-95550-6. ^ Bohr, N. (1922). "Nobel Lecture: The Structure of the Atom" (PDF). The Nobel Foundation. Retrieved 2008-12-03. ^ Lewis, G.N. (1916). "The Atom and the Molecule". Journal of the American Chemical Society. 38 (4): 762–786. doi:10.1021/ja02261a002. ^ a b Arabatzis, T.; Gavroglu, K. (1997). "The chemists' electron". European Journal of Physics. 18 (3): 150–163. Bibcode:1997EJPh...18..150A. doi:10.1088/0143-0807/18/3/005. ^ Langmuir, I. (1919). "The Arrangement of Electrons in Atoms and Molecules". Journal of the American Chemical Society. 41 (6): 868–934. doi:10.1021/ja02227a002. ^ Scerri, E.R. (2007). The Periodic Table. Oxford University Press. pp. 205–226. ISBN 978-0-19-530573-9. ^ Massimi, M. (2005). Pauli's Exclusion Principle, The Origin and Validation of a Scientific Principle. Cambridge University Press. pp. 7–8. ISBN 978-0-521-83911-2. ^ Uhlenbeck, G.E. ; Goudsmith, S. (1925). "Ersetzung der Hypothese vom unmechanischen Zwang durch eine Forderung bezüglich des inneren Verhaltens jedes einzelnen Elektrons". Die Naturwissenschaften (in German). 13 (47): 953–954. Bibcode:1925NW.....13..953E. doi:10.1007/BF01558878. ^ Pauli, W. (1923). "Über die Gesetzmäßigkeiten des anomalen Zeemaneffektes". Zeitschrift für Physik (in German). 16 (1): 155–164. Bibcode:1923ZPhy...16..155P. doi:10.1007/BF01327386. ^ a b de Broglie, L. (1929). "Nobel Lecture: The Wave Nature of the Electron" (PDF). The Nobel Foundation. Retrieved 2008-08-30. ^ Falkenburg, B. (2007). Particle Metaphysics: A Critical Account of Subatomic Reality. Springer. p. 85. ISBN 978-3-540-33731-7. ^ Davisson, C. (1937). "Nobel Lecture: The Discovery of Electron Waves" (PDF). The Nobel Foundation. Retrieved 2008-08-30. ^ Schrödinger, E. (1926). "Quantisierung als Eigenwertproblem". Annalen der Physik (in German). 385 (13): 437–490. Bibcode:1926AnP...385..437S. doi:10.1002/andp.19263851302. ^ Rigden, J.S. (2003). Hydrogen. Harvard University Press. pp. 59–86. ISBN 978-0-674-01252-3. ^ Reed, B.C. (2007). Quantum Mechanics. Jones & Bartlett Publishers. pp. 275–350. ISBN 978-0-7637-4451-9. ^ Dirac, P.A.M. (1928). "The Quantum Theory of the Electron" (PDF). Proceedings of the Royal Society A. 117 (778): 610–624. Bibcode:1928RSPSA.117..610D. doi:10.1098/rspa.1928.0023. ^ Dirac, P.A.M. (1933). "Nobel Lecture: Theory of Electrons and Positrons" (PDF). The Nobel Foundation. Retrieved 2008-11-01. ^ "The Nobel Prize in Physics 1965". The Nobel Foundation. Retrieved 2008-11-04. ^ Panofsky, W.K.H. (1997). "The Evolution of Particle Accelerators & Colliders" (PDF). Beam Line. 27 (1): 36–44. Retrieved 2008-09-15. ^ Elder, F.R. ; et al. (1947). "Radiation from Electrons in a Synchrotron". Physical Review. 71 (11): 829–830. Bibcode:1947PhRv...71..829E. doi:10.1103/PhysRev.71.829.5. ^ Hoddeson, L.; et al. (1997). The Rise of the Standard Model: Particle Physics in the 1960s and 1970s. Cambridge University Press. pp. 25–26. ISBN 978-0-521-57816-5. ^ Bernardini, C. (2004). "AdA: The First Electron–Positron Collider". Physics in Perspective. 6 (2): 156–183. Bibcode:2004PhP.....6..156B. doi:10.1007/s00016-003-0202-y. ^ "Testing the Standard Model: The LEP experiments". CERN. 2008. Retrieved 2008-09-15. ^ "LEP reaps a final harvest". CERN Courier. 40 (10). 2000. ^ Prati, E.; De Michielis, M.; Belli, M.; Cocco, S.; Fanciulli, M.; Kotekar-Patil, D.; Ruoff, M.; Kern, D.P. ; Wharam, D.A. ; Verduijn, J.; Tettamanzi, G.C. ; Rogge, S.; Roche, B.; Wacquez, R.; Jehl, X.; Vinet, M.; Sanquer, M. (2012). "Few electron limit of n-type metal oxide semiconductor single electron transistors". Nanotechnology. 23 (21): 215204. arXiv:1203.4811. Bibcode:2012Nanot..23u5204P. CiteSeerX 10.1.1.756.4383. doi:10.1088/0957-4484/23/21/215204. PMID 22552118. ^ Frampton, P.H. ; Hung, P.Q. ; Sher, Marc (2000). "Quarks and Leptons Beyond the Third Generation". Physics Reports. 330 (5–6): 263–348. arXiv:hep-ph/9903387. Bibcode:2000PhR...330..263F. doi:10.1016/S0370-1573(99)00095-2. ^ a b c Raith, W.; Mulvey, T. (2001). Constituents of Matter: Atoms, Molecules, Nuclei and Particles. CRC Press. pp. 777–781. ISBN 978-0-8493-1202-1. ^ a b c d e f g h i The original source for CODATA is Mohr, P.J. ; Taylor, B.N. ; Newell, D.B. (2008). "CODATA recommended values of the fundamental physical constants". Reviews of Modern Physics. 80 (2): 633–730. arXiv:0801.0028. Bibcode:2008RvMP...80..633M. CiteSeerX 10.1.1.150.1225. doi:10.1103/RevModPhys.80.633. Individual physical constants from the CODATA are available at: "The NIST Reference on Constants, Units and Uncertainty". National Institute of Standards and Technology. Retrieved 2009-01-15. ^ Zombeck, M.V. (2007). Handbook of Space Astronomy and Astrophysics (3rd ed.). Cambridge University Press. p. 14. ISBN 978-0-521-78242-5. ^ Murphy, M.T. ; et al. (2008). "Strong Limit on a Variable Proton-to-Electron Mass Ratio from Molecules in the Distant Universe". Science. 320 (5883): 1611–1613. arXiv:0806.3081. Bibcode:2008Sci...320.1611M. doi:10.1126/science.1156352. PMID 18566280. ^ Zorn, J.C.; Chamberlain, G.E. ; Hughes, V.W. (1963). "Experimental Limits for the Electron-Proton Charge Difference and for the Charge of the Neutron". Physical Review. 129 (6): 2566–2576. Bibcode:1963PhRv..129.2566Z. doi:10.1103/PhysRev.129.2566. ^ a b Odom, B.; et al. (2006). "New Measurement of the Electron Magnetic Moment Using a One-Electron Quantum Cyclotron". Physical Review Letters. 97 (3): 030801. Bibcode:2006PhRvL..97c0801O. doi:10.1103/PhysRevLett.97.030801. PMID 16907490. ^ Anastopoulos, C. (2008). Particle Or Wave: The Evolution of the Concept of Matter in Modern Physics. Princeton University Press. pp. 261–262. ISBN 978-0-691-13512-0. ^ Gabrielse, G.; et al. (2006). "New Determination of the Fine Structure Constant from the Electron g Value and QED". Physical Review Letters. 97 (3): 030802(1–4). Bibcode:2006PhRvL..97c0802G. doi:10.1103/PhysRevLett.97.030802. PMID 16907491. ^ Dehmelt, H. (1988). "A Single Atomic Particle Forever Floating at Rest in Free Space: New Value for Electron Radius". Physica Scripta. T22: 102–110. Bibcode:1988PhST...22..102D. doi:10.1088/0031-8949/1988/T22/016. ^ Meschede, D. (2004). Optics, light and lasers: The Practical Approach to Modern Aspects of Photonics and Laser Physics. Wiley-VCH. p. 168. ISBN 978-3-527-40364-6. ^ Steinberg, R.I.; et al. (1999). "Experimental test of charge conservation and the stability of the electron". Physical Review D. 61 (2): 2582–2586. Bibcode:1975PhRvD..12.2582S. doi:10.1103/PhysRevD.12.2582. ^ J. Beringer (Particle Data Group); et al. (2012). "Review of Particle Physics: [electron properties]" (PDF). Physical Review D. 86 (1): 010001. Bibcode:2012PhRvD..86a0001B. doi:10.1103/PhysRevD.86.010001. ^ Back, H.O. ; et al. (2002). "Search for electron decay mode e → γ + ν with prototype of Borexino detector". Physics Letters B. 525 (1–2): 29–40. Bibcode:2002PhLB..525...29B. doi:10.1016/S0370-2693(01)01440-X. ^ a b c d e Munowitz, M. (2005). Knowing, The Nature of Physical Law. Oxford University Press. ISBN 978-0-19-516737-5. ^ Kane, G. (October 9, 2006). "Are virtual particles really constantly popping in and out of existence? Or are they merely a mathematical bookkeeping device for quantum mechanics?". Scientific American. Retrieved 2008-09-19. ^ Taylor, J. (1989). "Gauge Theories in Particle Physics". In Davies, Paul (ed.). The New Physics. Cambridge University Press. p. 464. ISBN 978-0-521-43831-5. ^ a b Genz, H. (2001). Nothingness: The Science of Empty Space. Da Capo Press. pp. 241–243, 245–247. ISBN 978-0-7382-0610-3. ^ Gribbin, J. (January 25, 1997). "More to electrons than meets the eye". New Scientist. Retrieved 2008-09-17. ^ Levine, I.; et al. (1997). "Measurement of the Electromagnetic Coupling at Large Momentum Transfer". Physical Review Letters. 78 (3): 424–427. Bibcode:1997PhRvL..78..424L. doi:10.1103/PhysRevLett.78.424. ^ Murayama, H. (March 10–17, 2006). Supersymmetry Breaking Made Easy, Viable and Generic. Proceedings of the XLIInd Rencontres de Moriond on Electroweak Interactions and Unified Theories. La Thuile, Italy. arXiv:0709.3041. Bibcode:2007arXiv0709.3041M. —lists a 9% mass difference for an electron that is the size of the Planck distance. ^ Schwinger, J. (1948). "On Quantum-Electrodynamics and the Magnetic Moment of the Electron". Physical Review. 73 (4): 416–417. Bibcode:1948PhRv...73..416S. doi:10.1103/PhysRev.73.416. ^ Huang, K. (2007). Fundamental Forces of Nature: The Story of Gauge Fields. World Scientific. pp. 123–125. ISBN 978-981-270-645-4. ^ Foldy, L.L. ; Wouthuysen, S. (1950). "On the Dirac Theory of Spin 1/2 Particles and Its Non-Relativistic Limit". Physical Review. 78 (1): 29–36. Bibcode:1950PhRv...78...29F. doi:10.1103/PhysRev.78.29. ^ Sidharth, B.G. (2009). "Revisiting Zitterbewegung". International Journal of Theoretical Physics. 48 (2): 497–506. arXiv:0806.0985. Bibcode:2009IJTP...48..497S. doi:10.1007/s10773-008-9825-8. ^ a b Griffiths, David J. (1998). Introduction to Electrodynamics (3rd ed.). Prentice Hall. ISBN 978-0-13-805326-0. ^ Crowell, B. (2000). Electricity and Magnetism. Light and Matter. pp. 129–152. ISBN 978-0-9704670-4-1. ^ Mahadevan, R.; Narayan, R.; Yi, I. (1996). "Harmony in Electrons: Cyclotron and Synchrotron Emission by Thermal Electrons in a Magnetic Field". The Astrophysical Journal. 465: 327–337. arXiv:astro-ph/9601073. Bibcode:1996ApJ...465..327M. doi:10.1086/177422. ^ Rohrlich, F. (1999). "The Self-Force and Radiation Reaction". American Journal of Physics. 68 (12): 1109–1112. Bibcode:2000AmJPh..68.1109R. doi:10.1119/1.1286430. ^ Georgi, H. (1989). "Grand Unified Theories". In Davies, Paul (ed.). The New Physics. Cambridge University Press. p. 427. ISBN 978-0-521-43831-5. ^ Blumenthal, G.J. ; Gould, R. (1970). "Bremsstrahlung, Synchrotron Radiation, and Compton Scattering of High-Energy Electrons Traversing Dilute Gases". Reviews of Modern Physics. 42 (2): 237–270. Bibcode:1970RvMP...42..237B. doi:10.1103/RevModPhys.42.237. ^ Staff (2008). "The Nobel Prize in Physics 1927". The Nobel Foundation. Retrieved 2008-09-28. ^ Chen, S.-Y. ; Maksimchuk, A.; Umstadter, D. (1998). "Experimental observation of relativistic nonlinear Thomson scattering". Nature. 396 (6712): 653–655. arXiv:physics/9810036. Bibcode:1998Natur.396..653C. doi:10.1038/25303. ^ Beringer, R.; Montgomery, C.G. (1942). "The Angular Distribution of Positron Annihilation Radiation". Physical Review. 61 (5–6): 222–224. Bibcode:1942PhRv...61..222B. doi:10.1103/PhysRev.61.222. ^ Buffa, A. (2000). College Physics (4th ed.). Prentice Hall. p. 888. ISBN 978-0-13-082444-8. ^ Eichler, J. (2005). "Electron–positron pair production in relativistic ion–atom collisions". Physics Letters A. 347 (1–3): 67–72. Bibcode:2005PhLA..347...67E. doi:10.1016/j.physleta.2005.06.105. ^ Hubbell, J.H. (2006). "Electron positron pair production by photons: A historical overview". Radiation Physics and Chemistry. 75 (6): 614–623. Bibcode:2006RaPC...75..614H. doi:10.1016/j.radphyschem.2005.10.008. ^ Quigg, C. (June 4–30, 2000). The Electroweak Theory. TASI 2000: Flavor Physics for the Millennium. Boulder, Colorado. p. 80. arXiv:hep-ph/0204104. Bibcode:2002hep.ph....4104Q. ^ Mulliken, R.S. (1967). "Spectroscopy, Molecular Orbitals, and Chemical Bonding". Science. 157 (3784): 13–24. Bibcode:1967Sci...157...13M. doi:10.1126/science.157.3784.13. PMID 5338306. ^ Burhop, E.H.S. (1952). The Auger Effect and Other Radiationless Transitions. Cambridge University Press. pp. 2–3. ISBN 978-0-88275-966-1. ^ a b Grupen, C. (2000). "Physics of Particle Detection". AIP Conference Proceedings. 536: 3–34. arXiv:physics/9906063. doi:10.1063/1.1361756. ^ Jiles, D. (1998). Introduction to Magnetism and Magnetic Materials. CRC Press. pp. 280–287. ISBN 978-0-412-79860-3. ^ Löwdin, P.O. ; Erkki Brändas, E.; Kryachko, E.S. (2003). Fundamental World of Quantum Chemistry: A Tribute to the Memory of Per- Olov Löwdin. Springer. pp. 393–394. ISBN 978-1-4020-1290-7. ^ McQuarrie, D.A. ; Simon, J.D. (1997). Physical Chemistry: A Molecular Approach. University Science Books. pp. 325–361. ISBN 978-0-935702-99-6. ^ Daudel, R.; et al. (1974). "The Electron Pair in Chemistry". Canadian Journal of Chemistry. 52 (8): 1310–1320. doi:10.1139/v74-201. ^ Rakov, V.A. ; Uman, M.A. (2007). Lightning: Physics and Effects. Cambridge University Press. p. 4. ISBN 978-0-521-03541-5. ^ Freeman, G.R. ; March, N.H. (1999). "Triboelectricity and some associated phenomena". Materials Science and Technology. 15 (12): 1454–1458. doi:10.1179/026708399101505464. ^ Forward, K.M. ; Lacks, D.J. ; Sankaran, R.M. (2009). "Methodology for studying particle–particle triboelectrification in granular materials". Journal of Electrostatics. 67 (2–3): 178–183. doi:10.1016/j.elstat.2008.12.002. ^ Weinberg, S. (2003). The Discovery of Subatomic Particles. Cambridge University Press. pp. 15–16. ISBN 978-0-521-82351-7. ^ Lou, L.-F. (2003). Introduction to phonons and electrons. World Scientific. pp. 162, 164. ISBN 978-981-238-461-4. ^ Guru, B.S. ; Hızıroğlu, H.R. (2004). Electromagnetic Field Theory. Cambridge University Press. pp. 138, 276. ISBN 978-0-521-83016-4. ^ Achuthan, M.K. ; Bhat, K.N. (2007). Fundamentals of Semiconductor Devices. Tata McGraw-Hill. pp. 49–67. ISBN 978-0-07-061220-4. ^ a b Ziman, J.M. (2001). Electrons and Phonons: The Theory of Transport Phenomena in Solids. Oxford University Press. p. 260. ISBN 978-0-19-850779-6. ^ Main, P. (June 12, 1993). "When electrons go with the flow: Remove the obstacles that create electrical resistance, and you get ballistic electrons and a quantum surprise". New Scientist. 1887: 30. Retrieved 2008-10-09. ^ Blackwell, G.R. (2000). The Electronic Packaging Handbook. CRC Press. pp. 6.39–6.40. ISBN 978-0-8493-8591-9. ^ Durrant, A. (2000). Quantum Physics of Matter: The Physical World. CRC Press. pp. 43, 71–78. ISBN 978-0-7503-0721-5. ^ Staff (2008). "The Nobel Prize in Physics 1972". The Nobel Foundation. Retrieved 2008-10-13. ^ Kadin, A.M. (2007). "Spatial Structure of the Cooper Pair". Journal of Superconductivity and Novel Magnetism. 20 (4): 285–292. 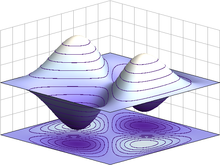 arXiv:cond-mat/0510279. doi:10.1007/s10948-006-0198-z. ^ "Discovery About Behavior Of Building Block Of Nature Could Lead To Computer Revolution". ScienceDaily. July 31, 2009. Retrieved 2009-08-01. ^ Jompol, Y.; et al. (2009). "Probing Spin-Charge Separation in a Tomonaga-Luttinger Liquid". Science. 325 (5940): 597–601. arXiv:1002.2782. Bibcode:2009Sci...325..597J. doi:10.1126/science.1171769. PMID 19644117. ^ Staff (2008). "The Nobel Prize in Physics 1958, for the discovery and the interpretation of the Cherenkov effect". The Nobel Foundation. Retrieved 2008-09-25. ^ Staff (August 26, 2008). "Special Relativity". Stanford Linear Accelerator Center. Retrieved 2008-09-25. ^ Adams, S. (2000). Frontiers: Twentieth Century Physics. CRC Press. p. 215. ISBN 978-0-7484-0840-5. ^ Lurquin, P.F. (2003). The Origins of Life and the Universe. Columbia University Press. p. 2. ISBN 978-0-231-12655-7. ^ Silk, J. (2000). The Big Bang: The Creation and Evolution of the Universe (3rd ed.). Macmillan. pp. 110–112, 134–137. ISBN 978-0-8050-7256-3. ^ Kolb, E.W. ; Wolfram, Stephen (1980). "The Development of Baryon Asymmetry in the Early Universe". Physics Letters B. 91 (2): 217–221. Bibcode:1980PhLB...91..217K. doi:10.1016/0370-2693(80)90435-9. ^ Sather, E. (Spring–Summer 1996). "The Mystery of Matter Asymmetry" (PDF). Beam Line. Stanford University. Retrieved 2008-11-01. ^ Burles, S.; Nollett, K.M. ; Turner, M.S. (1999). "Big-Bang Nucleosynthesis: Linking Inner Space and Outer Space". arXiv:astro-ph/9903300. ^ Boesgaard, A.M.; Steigman, G. (1985). "Big bang nucleosynthesis – Theories and observations". Annual Review of Astronomy and Astrophysics. 23 (2): 319–378. Bibcode:1985ARA&A..23..319B. doi:10.1146/annurev.aa.23.090185.001535. ^ a b Barkana, R. (2006). "The First Stars in the Universe and Cosmic Reionization". Science. 313 (5789): 931–934. arXiv:astro-ph/0608450. Bibcode:2006Sci...313..931B. CiteSeerX 10.1.1.256.7276. doi:10.1126/science.1125644. PMID 16917052. ^ Burbidge, E.M.; et al. (1957). "Synthesis of Elements in Stars". Reviews of Modern Physics. 29 (4): 548–647. Bibcode:1957RvMP...29..547B. doi:10.1103/RevModPhys.29.547. ^ Rodberg, L.S. ; Weisskopf, V. (1957). "Fall of Parity: Recent Discoveries Related to Symmetry of Laws of Nature". Science. 125 (3249): 627–633. Bibcode:1957Sci...125..627R. doi:10.1126/science.125.3249.627. PMID 17810563. ^ Fryer, C.L. (1999). "Mass Limits For Black Hole Formation". The Astrophysical Journal. 522 (1): 413–418. arXiv:astro-ph/9902315. Bibcode:1999ApJ...522..413F. doi:10.1086/307647. ^ Parikh, M.K. ; Wilczek, F. (2000). "Hawking Radiation As Tunneling". Physical Review Letters. 85 (24): 5042–5045. arXiv:hep-th/9907001. Bibcode:2000PhRvL..85.5042P. doi:10.1103/PhysRevLett.85.5042. hdl:1874/17028. PMID 11102182. ^ Hawking, S.W. (1974). "Black hole explosions?". Nature. 248 (5443): 30–31. Bibcode:1974Natur.248...30H. doi:10.1038/248030a0. ^ Halzen, F.; Hooper, D. (2002). "High-energy neutrino astronomy: the cosmic ray connection". Reports on Progress in Physics. 66 (7): 1025–1078. arXiv:astro-ph/0204527. Bibcode:2002RPPh...65.1025H. doi:10.1088/0034-4885/65/7/201. ^ Ziegler, J.F. (1998). "Terrestrial cosmic ray intensities". IBM Journal of Research and Development. 42 (1): 117–139. doi:10.1147/rd.421.0117. ^ Sutton, C. (August 4, 1990). "Muons, pions and other strange particles". New Scientist. Retrieved 2008-08-28. ^ Wolpert, S. (July 24, 2008). "Scientists solve 30-year-old aurora borealis mystery". University of California. Archived from the original on August 17, 2008. Retrieved 2008-10-11. ^ Gurnett, D.A. ; Anderson, R. (1976). "Electron Plasma Oscillations Associated with Type III Radio Bursts". Science. 194 (4270): 1159–1162. Bibcode:1976Sci...194.1159G. doi:10.1126/science.194.4270.1159. PMID 17790910. ^ Martin, W.C.; Wiese, W.L. (2007). "Atomic Spectroscopy: A Compendium of Basic Ideas, Notation, Data, and Formulas". National Institute of Standards and Technology. Retrieved 2007-01-08. ^ Fowles, G.R. (1989). Introduction to Modern Optics. Courier Dover. pp. 227–233. ISBN 978-0-486-65957-2. ^ Staff (2008). "The Nobel Prize in Physics 1989". The Nobel Foundation. Retrieved 2008-09-24. ^ Ekstrom, P.; Wineland, David (1980). "The isolated Electron" (PDF). Scientific American. 243 (2): 91–101. Bibcode:1980SciAm.243b.104E. doi:10.1038/scientificamerican0880-104. Retrieved 2008-09-24. ^ Mauritsson, J. "Electron filmed for the first time ever" (PDF). Lund University. Archived from the original (PDF) on March 25, 2009. Retrieved 2008-09-17. ^ Mauritsson, J.; et al. (2008). "Coherent Electron Scattering Captured by an Attosecond Quantum Stroboscope". Physical Review Letters. 100 (7): 073003. arXiv:0708.1060. Bibcode:2008PhRvL.100g3003M. doi:10.1103/PhysRevLett.100.073003. PMID 18352546. ^ Damascelli, A. (2004). "Probing the Electronic Structure of Complex Systems by ARPES". Physica Scripta. T109: 61–74. arXiv:cond-mat/0307085. Bibcode:2004PhST..109...61D. doi:10.1238/Physica.Topical.109a00061. ^ Staff (April 4, 1975). "Image # L-1975-02972". Langley Research Center, NASA. Archived from the original on December 7, 2008. Retrieved 2008-09-20. ^ Elmer, J. (March 3, 2008). "Standardizing the Art of Electron-Beam Welding". Lawrence Livermore National Laboratory. Retrieved 2008-10-16. ^ Schultz, H. (1993). Electron Beam Welding. Woodhead Publishing. pp. 2–3. ISBN 978-1-85573-050-2. ^ Benedict, G.F. (1987). Nontraditional Manufacturing Processes. Manufacturing engineering and materials processing. 19. CRC Press. p. 273. ISBN 978-0-8247-7352-6. ^ Ozdemir, F.S. (June 25–27, 1979). Electron beam lithography. Proceedings of the 16th Conference on Design automation. San Diego, CA: IEEE Press. pp. 383–391. Retrieved 2008-10-16. ^ Madou, M.J. (2002). Fundamentals of Microfabrication: the Science of Miniaturization (2nd ed.). CRC Press. pp. 53–54. ISBN 978-0-8493-0826-0. ^ Jongen, Y.; Herer, A. (May 2–5, 1996). Electron Beam Scanning in Industrial Applications. APS/AAPT Joint Meeting. American Physical Society. Bibcode:1996APS..MAY.H9902J. ^ Mobus, G.; et al. (2010). "Nano-scale quasi-melting of alkali-borosilicate glasses under electron irradiation". Journal of Nuclear Materials. 396 (2–3): 264–271. Bibcode:2010JNuM..396..264M. doi:10.1016/j.jnucmat.2009.11.020. ^ Beddar, A.S.; Domanovic, Mary Ann; Kubu, Mary Lou; Ellis, Rod J.; Sibata, Claudio H.; Kinsella, Timothy J. (2001). "Mobile linear accelerators for intraoperative radiation therapy". AORN Journal. 74 (5): 700–705. doi:10.1016/S0001-2092(06)61769-9. ^ Gazda, M.J.; Coia, L.R. (June 1, 2007). "Principles of Radiation Therapy" (PDF). Retrieved 2013-10-31. ^ Chao, A.W. ; Tigner, M. (1999). Handbook of Accelerator Physics and Engineering. World Scientific. pp. 155, 188. ISBN 978-981-02-3500-0. ^ Oura, K.; et al. (2003). Surface Science: An Introduction. Springer. pp. 1–45. ISBN 978-3-540-00545-2. ^ Ichimiya, A.; Cohen, P.I. (2004). Reflection High-energy Electron Diffraction. Cambridge University Press. p. 1. ISBN 978-0-521-45373-8. ^ Heppell, T.A. (1967). "A combined low energy and reflection high energy electron diffraction apparatus". Journal of Scientific Instruments. 44 (9): 686–688. Bibcode:1967JScI...44..686H. doi:10.1088/0950-7671/44/9/311. ^ McMullan, D. (1993). "Scanning Electron Microscopy: 1928–1965". University of Cambridge. Retrieved 2009-03-23. ^ Slayter, H.S. (1992). Light and electron microscopy. Cambridge University Press. p. 1. ISBN 978-0-521-33948-3. ^ Cember, H. (1996). Introduction to Health Physics. McGraw-Hill Professional. pp. 42–43. ISBN 978-0-07-105461-4. ^ Erni, R.; et al. (2009). "Atomic-Resolution Imaging with a Sub-50-pm Electron Probe". Physical Review Letters. 102 (9): 096101. Bibcode:2009PhRvL.102i6101E. doi:10.1103/PhysRevLett.102.096101. PMID 19392535. ^ Bozzola, J.J.; Russell, L.D. (1999). Electron Microscopy: Principles and Techniques for Biologists. Jones & Bartlett Publishers. pp. 12, 197–199. ISBN 978-0-7637-0192-5. ^ Flegler, S.L. ; Heckman Jr., J.W. ; Klomparens, K.L. (1995). Scanning and Transmission Electron Microscopy: An Introduction (Reprint ed.). Oxford University Press. pp. 43–45. ISBN 978-0-19-510751-7. ^ Bozzola, J.J.; Russell, L.D. (1999). Electron Microscopy: Principles and Techniques for Biologists (2nd ed.). Jones & Bartlett Publishers. p. 9. ISBN 978-0-7637-0192-5. ^ Freund, H.P. ; Antonsen, T. (1996). Principles of Free-Electron Lasers. Springer. pp. 1–30. ISBN 978-0-412-72540-1. ^ Kitzmiller, J.W. (1995). Television Picture Tubes and Other Cathode-Ray Tubes: Industry and Trade Summary. Diane Publishing. pp. 3–5. ISBN 978-0-7881-2100-5. ^ Sclater, N. (1999). Electronic Technology Handbook. McGraw-Hill Professional. pp. 227–228. ISBN 978-0-07-058048-0. ^ Staff (2008). "The History of the Integrated Circuit". The Nobel Foundation. Retrieved 2008-10-18. Bock, R.K.; Vasilescu, A. (1998). The Particle Detector BriefBook (14th ed.). Springer. ISBN 978-3-540-64120-9. Copeland, Ed. "Spherical Electron". Sixty Symbols. Brady Haran for the University of Nottingham.